Over the summer, you set a vision for teacher coaching in your school. You and your leadership team set goals and teacher coaching standards, designed teacher coaching forms, and communicated to teachers that coaching would be frequent and growth-oriented... then, the chaos of the school year hit. How do I stay on top of teacher coaching for teachers in my school when I’m pulled in a hundred different directions? How can I energize and engage my leadership team around teacher coaching, and easily keep everyone updated on how we are doing? We just got our interim results back and we need to kick it into high gear. How do I ensure my team is coaching on our new instructional priorities to maximize the time they spend with teachers? How do i get my teachers better, faster? To answer these questions, thousands of schools have shifted from stodgy, annual performance evaluations to high-frequency teacher coaching model that increases the number of feedback touch-points a teacher receives throughout the year. Rather than giving teachers a list of strengths and weaknesses at the end of a school year, school leaders now spend 10-15 minutes in classrooms on a weekly or monthly basis, observing for one high-leverage step a teacher can take to improve their practice. With this type of teacher coaching model, leaders and teachers meet to debrief the observation and collaboratively set an action step for growth. Teacher coaching makes teachers engaged and energized because they are constantly growing and supported, and leaders are tied into what’s happening in classrooms. Managing multiple spreadsheets for 30+ teachers is unwieldy and quickly becomes impractical. Tracking classroom observation notes, feedback, and action steps for 40 weeks’ worth of teacher coaching is cumbersome at best. Spreadsheets provide no easy way to give ongoing feedback. There is no way to capture time-stamped notes. Some schools swing the other way and use outdated, clunky teacher evaluation platforms that were made only for scoring rubrics and printing reports once a year. With these platforms, it’s nearly impossible to capture action steps, track classroom observation frequency, or analyze trends in the frequent feedback your team is sharing with teachers. whetstone was built for schools. Spreadsheets and heavyweight platforms don’t work for schools trying to move fast and improve outcomes with teacher coaching. Whetstone was built with school leaders in mind to make it super easy to manage teacher coaching. Gives schools one home for everything related to classroom observation, feedback, and coaching meetings (and evaluation). Lets leaders see real-time data on observation frequency, action steps, and teacher coaching trends, in addition to standard evaluation reports. Engages teachers and leaders by enabling them to see how their work during coaching sessions is moving the needle forward. Lets you quickly and seamlessly share vital feedback with teachers, and the right data with the right people at the right time. Intuitive and easy to use. One digital home for teacher coaching lets you quit fighting with spreadsheets and chasing down feedback in email chains. Built-in teacher coaching best practices structure your team’s work around proven teacher coaching strategies. Flexible and customizable: Whetstone knows every school is different. 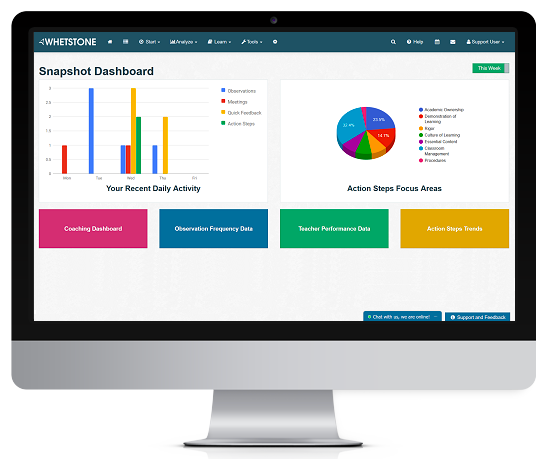 That’s why we made it easy to customize Whetstone with your school’s unique teacher coaching process. Teacher coaching analytics let you measure teacher growth with more than just numbers. Seamless sharing lets you send feedback to teachers with the click of a button.